I like eating microwaveable meals. To me they are easy and if you pick the right brand they can give you that false sense of healthy eating. But I have come to realize that my body does not do well with too many preservatives. I guess eating microwaveable meals for breakfast, lunch and dinner isn’t good for my body. I don’t want to spend hours in the kitchen. For some reason actually cooking a meal makes me less hungry and never tastes as good as someone else making it. But now I actually have to starting cooking and I am not very good at it. So I am starting with really easy meals. My mom gave me this recipe. I couldn’t believe she gave me a recipe that requires me to handle raw chicken. Just thinking about raw chicken makes my stomach turn over. I believe the color and feel of it reminds me of a pet I had once. 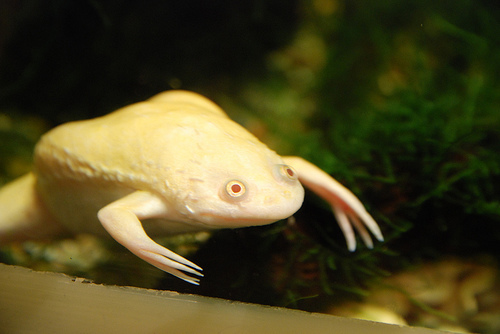 It was an African Albino Aquatic Frog that a friend from my first year in college gave me. That’s exactly what I did. I think it came out pretty good and so did my roommate. Try the recipe and tell me what you think. Wash chicken and cut off excess fat. Dry with paper towel lay to the side. In bowl combine canned soups. Fill each can 1/3 full with milk and pour into bowl. Add rice, garlic powder and Worchester sauce. Stir until mixed. You do not want the mixture to be thick. The rice needs time to cook. Spray Pam in pan. Pour mixture into pan then place chicken breast into mixture. 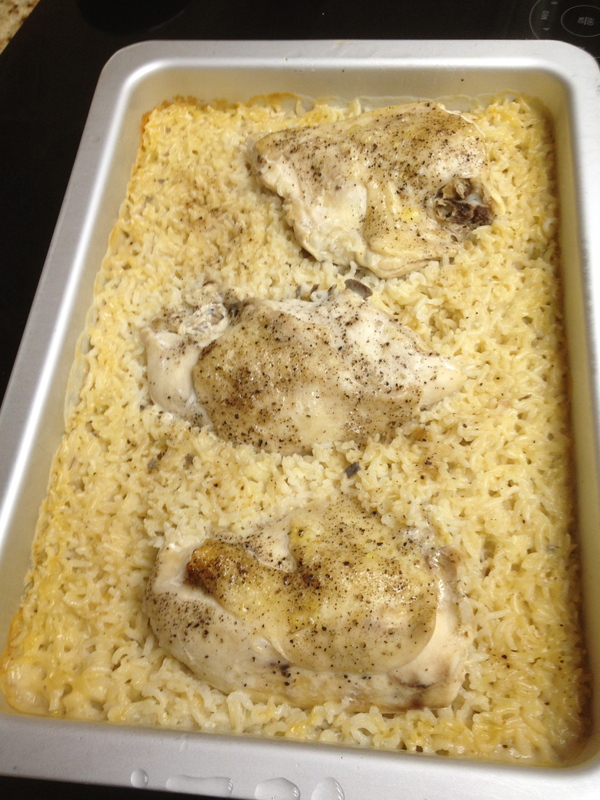 Do not cover the tops of the chicken with mixture because it will make it too crunchy. Sprinkle pepper over dish. Put in oven at 350 degrees and cook for 60 minutes. Check to make sure rice is fully cooked. Cool before eating.